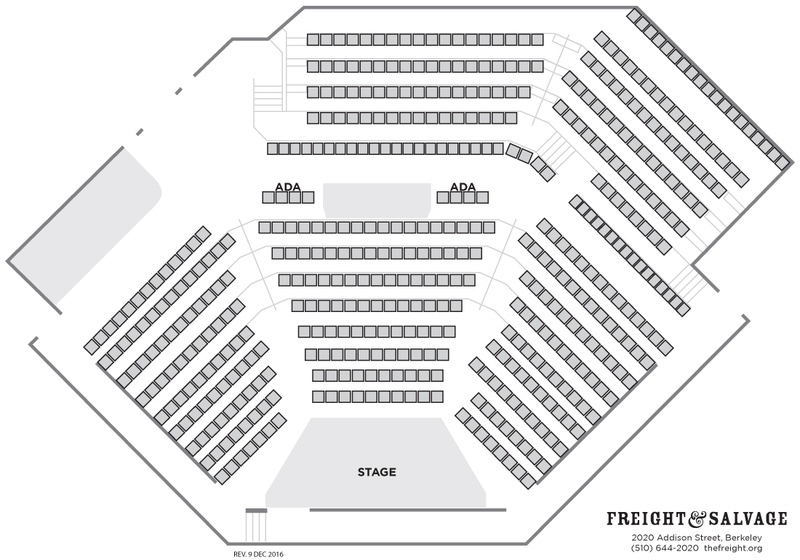 Please call (510-644-2020 x120) or email (info@freightandsalvage.org) the Freight box office with questions about accessibility or requests for assistance. Please call or email the Freight box office in advance with special seating requests, if possible. In order to best accommodate your needs, we request that you contact us at least 24 hours prior to the performance. We can only promise 1+companion seat for busy or sold-out shows. Special seating will be held until 8:30 pm for busy or sold-out shows. We provide assisted-listening devices upon request. A hearing loop system that transmits directly to hearing aids with a t-coil is also available; t-coil wearers should sit within the looped area of the auditorium (view seat map). Assistive listening devices also available on request. * Hearing loop system made possible by OLLI donor K. Patricia Cross. For specific shows, seating may be different. Please check the online listing for the show you are interested in.